VIZIO is a quietly big name in the industry of budget LCD TVs in the US. After their reputation was spread all over their hometown, they started manufacturing the first model of sound bar in 2014, called the VIZIO SB3821-C6 2.1 Channel Sound Bar. Let’s read my Vizio sb3851-c0 review and get into more details! VIZIO keeps their devices simple with a sleek body in black grilles and brushed aluminum, which makes them look simple yet exhilaratingly eye-catching. I’m pretty sure that you will fall in love with their appearances at first glance. One more great thing is that the soundbar is designed to be either mounted on the wall or simply placed on the table top. VIZIO features their devices with the 5.1-channel technology (left, right and center channels) that rises the sound quality to a superior level where you can emerge yourself in the environment of crystal clear and ultra realistic audio quality. Other technologies, including the Dolby Digital Surround, DTS Digital Surround, DTS Circle Surround and DTS Studio Sound, make it one of the best audio speakers on the market in terms of the performance. 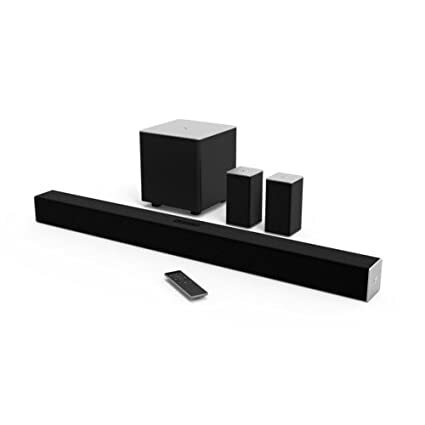 Even better than the predecessor – VIZIO SB3821-C6 2.1 Channel Sound Bar – which comes with a subwoofer only, this 5.1-channel model includes two VIZIO rear satellite speakers to spread the sound throughout your room. Moreover, the subwoofer allows a flawless wireless connection to the sound bar, so you can place it anywhere in your house (less than 60 feet away) depending on how much bass you want to hear. In spite of being an innovative sound bar system, the VIZIO SB3851-C0 5.1 can be compatible with old-style TV (early than 2007 or even more). This versatility is achieved thanks to the thoughtfulness of VIZIO. Particularly, they give you up to three options of connections, including a digital Toslink cable, an RCA cable and a digital coaxial cable. This is also a big step over VIZIO’s competitors who usually supply only one or two types of cables. The soundbar integrates a Bluetooth connectivity feature that allows you to wirelessly share your audio files from your digital gadgets to the unit much more convenient. Now, you can lose the wires and listen to your favorite songs with a touch of a finger from anywhere in your room. Being equipped with various features doesn’t make the VIZIO SB3851-C0 5.1 under powered. By contrast, if you measure each portion of the wave length, the sound bar itself can reach up to 50Hz of max frequency and 100 dB of max SPL, while maintaining the crystal clear sound under 1% of harmonic distortion. This means it gives you full saturation in low settings in a standard sized living room. As you increase to the mids, the sound becomes clearer and more defined. Furthermore, the VIZIO SB3851-C0 5.1 has all the advanced sound technologies of VIZIO. They are the Dolby Digital Surround (improves audio definition and spatial dimension to soundtracks), DTS Digital Surround (offers cinema-grade home listening experience), DTS Circle Surround (supports various surround sound creations and play back applications), DTS Studio Sound (improves speakers’ acoustic capabilities and provides a consistent listening volume). Together, they bring you to an audio entertainment experience like no other. 5.1 channels of audio provide an enveloping 360 degrees of clear, crisp, rich sound. It comes with three most common cables to connect to your TV easily. It comes with a remote control for quick and convenient operating. It has a full metal design with black grilles and brushed aluminum. It has a built-in Bluetooth connectivity feature, allowing wirelessly sharing of audio files. It features a row of LEDs on the left side of the sound bar to indicate the unit’s current status, which is not as easy to read as an LCD screen. The Bluetooth streaming sometimes lags, slowing the sound down. In spite of having some drawbacks, the merits of VIZIO SB3851-C0 5.1 easily outweigh its demerits. If you’re in need of a high-quality home entertainment unit, this one is a fantastic choice without breaking the bank. Now it’s time to make your own decision! Thank you for reading my VIZIO SB3851-C0 38-Inch 5.1 Channel Sound Bar Review! Bose Cinemate 15 Review – Worth Reading For A Good Deal! Previous Post 2.1 vs 5.1 soundbar – How to differentiate like an expert? Next Post Bose Cinemate 15 Review – Worth Reading For A Good Deal!